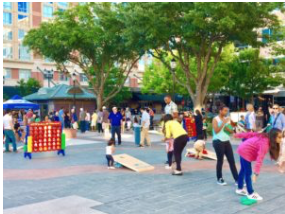 We’re turning the Plaza into one big backyard party, so come hang out and have some fun with family & friends, because Jupiter will be serving beer and wine for $5 and we’ll have lawn games setup! Plus, enjoy live music from Southern County Line. Named the 2018 CMA of Texas Band of the Year and made up of members of the former high-energy, dynamic, crowd-pleasing Chris Brade Band, Southern County Line has become one of the premier country music acts in the Houston area.